A bench grinder is a key tool for any home shop. The main function of bench grinders is to keep your other tools in top working condition. Mainly this is done by keeping cutting blades sharp. The reason this is so important is a sharp blade is a lot safer than a dull one. Also, a sharp blade on another tool will cut faster and do the job at hand more consistently. That is why it is important to have a way to sharpen blades whenever you need too. You may think you could just buy new blades whenever the old ones get dull, but that is a waste of money. If you are doing any amount of regular work in a shop, then a bench grinder is an investment that will pay for itself quickly. Why and how to use a Bench Grinder? How to Mount a Bench Grinder? Bench Grinders come in a variety of sizes. If you have a small shop than a smaller one with one-quarter or one-half horse power should be sufficient enough. You can get half-inch to inch cutting wheels for these. If you are doing more heavy duty work though or using it a lot you might want to consider getting one with a larger motor or one that can support larger wheels. Some models can handle wheels upwards of eight inches in size. This makes for a larger surface area to use to grind things speeding up the process or making it so you can grind larger things. I know I mentioned that bench grinders are for sharpening blades, but they can also be used for many other things besides this. Some other common uses for a bench grinder are grinding down rivets, smoothing weld joints, or smoothing the edge of wood after it has been cut. On top of this, you can also use it to repair cold chisels, drill bits, plan irons, and knives or cutting tools. This means that once you have a bench grinder you will probably be coming to it and using it more often then you thought. That is why it is a good idea to read reviews and invest in the best bench grinder you can afford. You don’t want to buy one now to have to replace it later because it doesn’t do everything you need it to do. Now that you know the basic uses of a bench grinder we can look into the basic parts. I have already mentioned that the motor is in the middle and comes in different size horse power. The horse power effects a number of revolutions per minute or RPM that the grinding wheels have. If you are familiar with cars then RPM will be a concept that you understand, but basically the faster the wheels spin the faster you can get your work done. Also, if you are working on hard metals such a thick steel you will need faster speeds than if you are just working on wood. Most bench grinders’ speeds range from 3000 rpm to 3600 rpm. The grinding wheels hook onto the side of the grinder and go into housings known as spark deflectors. These spark deflectors also known as wheel guards cover about seventy-five percent of the wheel, but the front twenty-five percent is exposed so you can use that surface to work. The spark deflectors like the name indicate tries to prevent sparks from flying towards you. When grinding on metal you especially get a lot of sparks, but even grinding wood sends fragments out. By having the grinding wheels covered it helps contain these fragments so they don’t get all over your shop or into your skin. Another function of the housings around the grinding wheels is to help keep your fingers or other objects out of the grinding wheel. You have to work carefully not to get your hand to close when grinding because the wheel will act like sand paper on your skin and flatten and cut into it just like it would the metal or wood. Also, if the vibration causes something to fall onto your bench grinder or you accidentally knock something off of your bench because you didn’t keep the area clean and organized the spark deflectors keep the falling object form hitting the grinding wheels and shooting wherever. Another part that serves a similar function to the housings is the eye shield. This part is generally a clear plastic and is located above the opening where you can work your material on the grinding wheel. This is an added precaution to make sure that any scraps to not come up and hit you in the face or eyes. However, it is still good practice to wear eye protection when working with a bench grinder. It is better to be too safe and not get hurt then to not be cautious enough and end up with an accident happening. The last part of getting into different types of wheels is the tool rest. This is used to place the tool you are working on to when not using it. 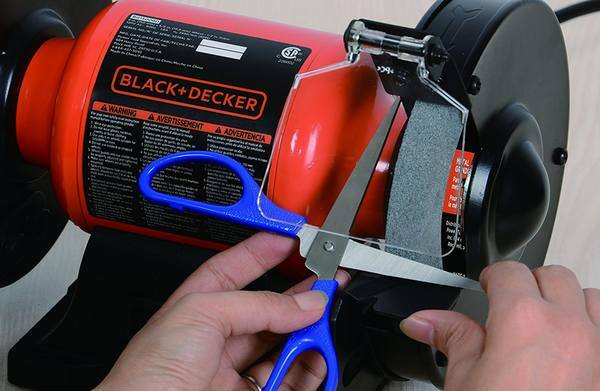 This comes in handy if you are needing to sit the tool down to adjust the speed of the grinder or if you need to change out a wheel. Also, if you are wanting to just sharpen a bunch of drill bits you can have them all line up setting on the tool rest and that way you wouldn’t have to walk back and forth to get the next on to get sharpened. The tool rest is also used to rest the tool on while working on it. This keeps you from having slips and provides more balance. While still a part of the bench grinder I am breaking it into its own section because there is a lot to be said about them. The wheel is the part that is doing all the real work and there are many different types. You have course wheels, fine wheels, straight wheels, tapered wheels, and even more. Each wheel serves its own purpose and has a use that it does best. On top of the different types, they are also made with different material on the grinding surface and can have different grit. Different wheels can even have different hardness and also have an rpm rating. When choosing a bench grinder wheel it is important to pick one that is designed for the job you are doing. You also want to make sure it is rated for the speed of your grinder. If you use a wheel on a faster setting than it can handle, then you could end up with the wheel exploding. This can still happen with proper use and that is another reason for the wheel guard, but it is much less likely to happen if you take care of your wheels and use the proper ones. The most commonly used wheel is the straight wheel. It produces a concave surface which makes it good for sharpening chisels and other tools. Any type of surface grinding can be done with a straight wheel, but they can also do the centerless and cylindrical grinding. Another type of wheel is a tapered wheel. This wheel is tapered towards the edges and can be used for more delicate work. One common use for this type of wheel is grinding threads or gear teeth. Due to being tapered you can get into the groves a lot more easily using this wheel. If you got a lot of saw blades that need sharpened then you will want to invest in a saucer wheel. A few other wheels that exist, but are very specialized are dish cup wheels and straight cup wheels. If you have a used for one of these, then you will probably know what it does. If you need a larger grinding surface than the standard horizontal wheels can provide, then you can get a cylinder wheel. They are hollow and have use vertically or sometimes horizontally if your grinder is big enough. They can go all the way up to 12 inches so if you ever needed to grind a big sheet of metal all at once, then this might be the option you will have to use. If you are working with the really hard material, then you may want to consider getting a diamond wheel. These are coated with small bits of diamond on the edge and can cut pretty much anything. Speaking of diamond wheels leads perfectly into grit type. The diamond wheels have a diamond grit. The most common type of grits, however, are normally aluminum oxide which can be a variety of colors from pink, white, to red, or brown. Next is silicon carbide which is black or green. Another grit is ceramic which is blue or pink, or you can have a combination of these. The most common grit is the aluminum oxide and the most common colors are gray and brown. Color effects toughness as well as cost. The gray and brown are the workhorses thanks to the fact that they are inexpensive, but get the job done. They are general purpose and can be used on low or high carbon steel. Pink and white are used on harder steel which needs a cooler cutting action to avoid burns and they cost a little more than the gray and brown. Ruby red is the most expensive and is used on tool steel and is an especially tough grit. Silicon carbide is normally black or green. The black is used on softer metals such as aluminum and even on plastic. The black silicon carbide is extremely sharp. Another area where it is used is of stone such as marble so if you want to grind the edge of a counter top it is the go to grit. Green silicon carbide is even sharper though then the black and used for strong metals such as titanium or plasma sprayed material. Silicon carbide can still be used on steel, but it is actually a finishing grit. It provides a nice polished surface when used on steel. Ceramic is a newer grit that is available. One advantage of ceramic is it doesn’t dull. Instead, it fractures into sharper pieces as you use it. This is cool and saves time and money on having to resurface your grinding wheels. The downside, however, is ceramic wheels are expensive and most wheels only mix a little ceramic with another type of wheel. Due to the cost, it can be hard to find a profitable way to use ceramic wheels, but as time goes on they may become more affordable or you may find a special use for them that makes them work for you. Next, we get to grit size which effects the finish you get when grinding. Grit is generally in four categories which are coarse, medium, fine, and superfine. Course grit is those from 16-24, medium from 36-60, fine from 80-120, and superfine from 150 on up. The coarser the grit the faster material is removed. This makes work quicker but leaves a rougher surface. When you want to remove less material and start working on the finish you move to finer grits till you have it ground and polished the way you wanted. The last aspect of the grinding wheel that I will cover here is hardness. Hardness is rated from A-Z. “A” is the softest and “Z” is the hardest. The harder the material you are working on the softer you want the grinding wheel to be. The harder the wheel the longer it will last, but you don’t want it to be too hard that it damages what you are working on. Also, it is important to stick with one manufacturer when buying wheels because one companies “F” hardness could be another company “G” hardness. There is no set standard on how hardness is rated across brands. You can also get a fine wheel instead of a course wheel. The fine wheel is generally a brush that is used for polishing. The advantage to having a fine wheel on one side and a course wheel on the other is you can grind and polish right back to back. The down side is a fine wheel takes more care to take care of. So, in the beginning, I mentioned what you can use a bench grinder for, but why choose to use one over some other type of grinder. Well, first they can do a lot of different things. Why have three different tools or more to do the job that one ﻿﻿bench grinder can do? Also, because it can do so many different tasks it is very cost effective. Another thing that is great about a bench grinder is it is easy to use and maintain. Once you have it set up properly it is ready to go. Just mount it to your bench and have the wheels you commonly use on it and most likely you can start using it quickly. Lastly, they offer a lot more control than smaller handheld grinders can offer you. This is because you can stand while using it and also it has the tool rest to help you guide the item into the grinding wheel. As for using a bench grinder, it is simple. You put the proper stone on it for the job and then you set it on the right speed. After that, you guide the tool careful and gentle into the grinding wheel. The key thing is you want to make smooth movements. You don’t want to be jerking or get tired while using it. You want to be comfortable. The key thing is to set the grinder up right. When mounting the wheel you want to make sure that the washers are tight so the wheel doesn’t get dislodged. This is also important for keeping the wheel balanced. Back to the car reference the grinder wheel is like a tire and needs to be rotated on occasion to make sure it is staying round and wearing correctly. You want to make sure the wheel stays on track so it doesn’t chip or fragment. One way to make sure a grinding wheel is properly balanced is to give it a tap and it should sound like a hotel bell. If it does you are good but if not, then you need to replace it. When using the grinder you also want to make sure you are using it at the right speed based on the wheel being used. You have to factor in the wheel material, but also the material you are grinding. As you grind heat builds up and this can cause the wheel to wear. You don’t want the wheel getting too hot or it can fracture or explode. You can sue coolants to prevent this, but that isn’t always the best option. It is better to be safe and work at a slower speed than to go too fast. Another thing that affects how fast a safe speed for the wheel is, is the wheel size. The bigger the wheel the slower you need to go. Just be sure to read the packaging of the wheel you are using. The proper angle you use depends on the material and the job you are doing. If you want a sharp edge on something then you will have to use a sharper angle. If you are just using the grinder as a way to sand some material or polish some material then you may not need as much of an angle. One key thing to remember though is you want to keep your pressure forward. The wheels are designed to handle pressure coming down on them from the front and top. You never want to try to use the edge of the wheel or use it from the side. You may think you can get more use out of the stone, but this can heavily damage the grinder. This can cause the router to warp from the pressure and can also cause the stone to be damaged. Always keep the pressure forward and don’t try to extend the life of the stone by putting yourself at risk by using the side. Back to addressing the issue of friction and overheating you have to option for coolants. There is a dipping pan option where you dip the metal you are working with into the coolant. This is method is convenient and quicker. By having a dipping tray you don’t have to wait for the metal to cool down while working on it. The other option is a rolling pan. The rolling pan cools the stone as it spins. By cooling the stone you are not actually cooling the metal so the metal could still warp as you work on it. That is why generally the dipping pan is a better option, but the dipping pan doesn’t protect the stone from heat. You could always combine the options to protect everything. Since I have been talking about grinding metal a lot the first type of bench grinder I will cover is the automotive bench grinder. This type is mainly used for metal and making parts for various things. The benefits to this type of grinder are they are extremely stable. Also, they stay balanced well and can be reused longer than most without adjustments having to be made. If you are doing a lot of repetitive tasks you might want to consider this option. Next is the woodworking bench grinder. This type of grinder is mainly for sharpening tools. They generally run at slower speeds so you can sharpen the tool preciously because precision is so important in woodworking. You can also use it to grind the edge of wood or to sand wood. 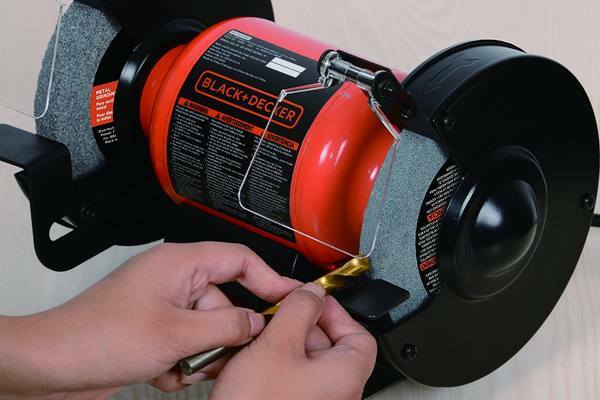 If you don’t want a full-size bench grinder you can get a mini electric grinder. A mini bench grinder is portable and smaller than a full-size one, but can still do most of the same jobs. They come in handy if you are working on a site somewhere and might need to repair or make tool adjustments quickly wherever you are. The only downside is they are less powerful so working on harder metals can be an issue sometimes. Lastly is the standard variable speed bench grinder. It is a full-size grinder that you can adjust the speed you are using it on. This means you can use all kinds of wheels on it and also do all kinds of different jobs with it. The variable speed is also good because you don’t have to be precious with your touch as with a normal bench grinder. You can control the speed to control the cutting power. Also remember that you have to choose between a 6 inch bench grinder or a 8 inch bench grinder. Lastly, you need to know how to mount a bench grinder if you are considering getting one or have one. First, you must measure the distance between the bolts and the table. You want to ensure proper spacing so the grinding wheels do not hit the table surface. To do this you will probably need to mount the grinder to a piece of wood and then mount that wood to the table. After you measure you must drill holes large enough in the wood so you can slide it over the work bench and be able to get the bolts in it. After you got the holes lined up with the grinder and the ones you made to mount it you just slide the bolts through and put washers on the other side. Then you just tighten it down. You don’t want to over-tighten and crack the wood, but you want it to be secure. We recommend mounting your bench grinder in a bench grinder stand if you need to move around your shop or garage. The key to having success with a bench grinder is getting a good one to start with. It will save you a lot of money, in the long run, to spend a little more upfront than to get something inferior that you will have to replace. Also, make sure you mount it correctly as that is the easiest way to damage the grinder is by mounting it wrong. You also want to regular check the wheels and brushes to make sure they are in good shape. You don’t want them exploding and hurting you or the grinder. Paying attention to the metal and wheel temperature is also important for safety. Other things to keep in mind is the types of jobs you will be doing with the grinder. If you are just a woodworker then you won’t need as powerful of a grinder as an auto mechanic. 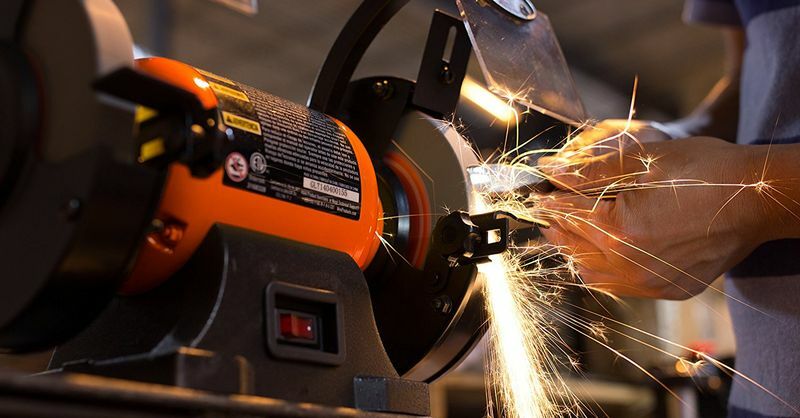 A bench grinder can do a lot of jobs really well and you want to keep in mind what you plan to do with yours so you find the perfect one to meet your needs. You also need to remember that the grinding wheels you choose are a big part of how your grinding experience will go and you want to get quality ones that are suited for the job you are doing. Once you have a bench grinder you will find yourself using it all the time and it will save you a lot of money.